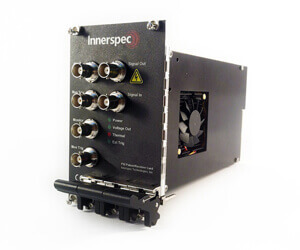 The Innerspec PXI Pulser/Receiver is a high-power ultrasonic instrument designed to be installed on a standard PXI or CompactPCI chassis. 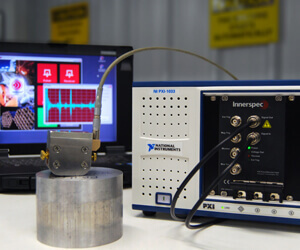 The instrument provides 8kW (1200Vpp toneburst) of power which is ideal for researchers and integrators interested in a compact, high-power ultrasonic instrument to drive EMAT and piezoelectric transducers (standard or air-coupled).The pulser can be operated directly from the PXI computer using dedicated software that permits modifying all pulsing parameters, or use the factory-provided drivers to set the equipment from a separate application. The received signal can be viewed on the same computer, an external oscilloscope, streamed to another application. Data streaming can include TOF and Peak-Amplitude for three independent gates or the complete waveform of the signal, all at full PRF rates. Driver application examples are provided in both C++ and Labview. The unit permits operation in Pitch-Catch or Pulse-Echo modes using a built-in Transmit/Receive switch. 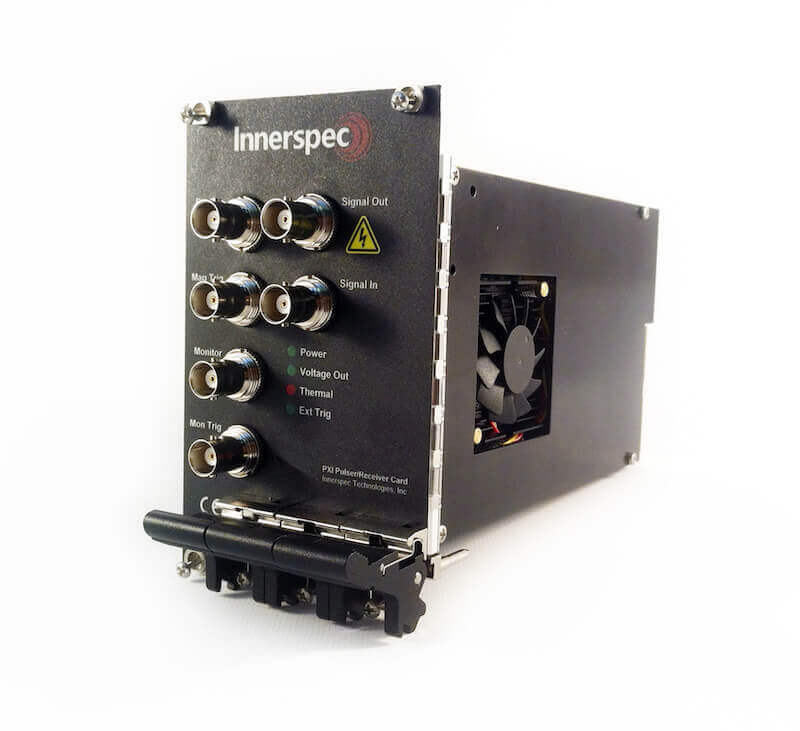 The Innerspec PXI Pulser/Receiver is the most power-dense instrument in the market and the only high-power ultrasonic tone-burst pulser that can be integrated in a conventional PXI or CompactPCI chassis. Software Application based on our ITOP® technology to select and manage settings (Frequency, Number of Cycles, Delays, and Other Configuration). Internal or External Trigger Mode. External 5VDC Trigger Input with Configurable Divider (e.g. Encoder Trigger). External Trigger Output for Electromagnet Pulser Control. Drivers provided to allow parameter modification, A-Scan and C-Scan data streaming. User SDK with driver example code in both C++ and LabVIEW.